Black Warrior Riverkeeper - What Is a Watershed? Watershed – A watershed is all the land area that drains into a particular body of water, such as a creek, fork, river, swamp, wetland, lake, bay, estuary, gulf, or ocean. 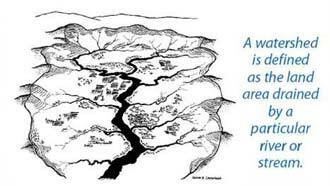 A watershed includes not only the streams and rivers that convey the water but also all the land that drains into them. Watersheds for different rivers are separated by major geologic features such as ridges or mountains. Other names for a watershed are drainage area, drainage basin, and river basin. 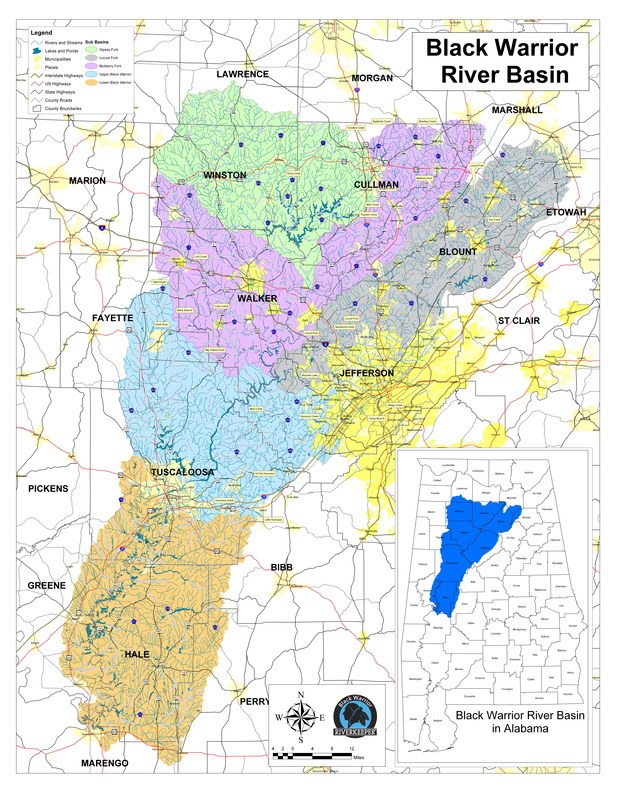 The Black Warrior River watershed drains parts of 17 counties in Alabama. No matter where you are, you are in a watershed. Be a good steward and don’t spill or dump toxic materials and trash on the ground, on paved surfaces, or down storm drains. When it rains pollutants either soak through the ground into groundwater (which is ultimately connected to surface water) or they flow into nearby surface waters via drains, ditches, and streams. Keeping your property clean and disposing of waste properly – including recycling – are key to living in a healthy watershed. Please be a good neighbor – we all live downstream!